Poetry Out Loud featuring Rosie Reyes, Gypsy Prince, Riley Knowles, Laurel Sleeper, Kate Walters, Bethany Ross, and Jessica Nguyen. Poetry Out Loud: National Recitation Contest is a free program sponsored by the National Endowment for the Arts and the Poetry Foundation. Poetry Out Loud encourages youth to learn about great poetry through memorization and performance while mastering public presentation skills, building self-confidence and learning about literary heritage. Participating teachers receive free multimedia curriculum materials — a poetry anthology, audio guide, teachers’ guide, posters and comprehensive website all aligned to national standards — augmenting their regular poetry curriculum with poetry performance and a classroom-level competition. School-level champions compete to advance to the regional, state and then national levels. Schools wishing to participate must register online before December 18, 2015. 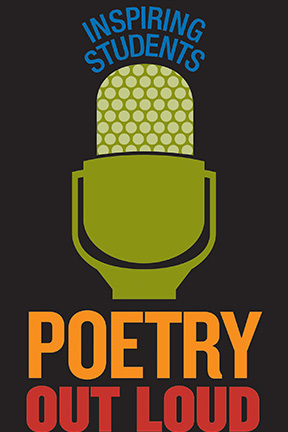 Poetry Out Loud students will give a Pop-Up Reading at 12pm in Northwest Art (Main Building, 4th Floor).